This isn’t a list of the most frequently asked questions that we get, but this is a general SEO FAQ. Some of these questions are actual questions that we’ve received, or may have overheard, or maybe we just made it up right here on the spot. The point is, you have questions and we have answers. If you want to ask us a question, you can do so at the bottom of this page. Let’s make this a living FAQ, rather than the traditional, static, dead FAQ most companies have. Isn’t that an exciting concept? To optimize your website using “white-hate SEO”, simply means that you will earn your Google rankings naturally. There are many ways to do this, including writing good content and having a website that is generally useful to visitors. For example, every website should have an easily accessible FAQ page. Sort of like this. Do you guarantee your SEO services? We offer a 100% guarantee, but we do not offer it to every client, for every service. For example, if you have been penalized by Google, we can help you get your rankings back, but since it’s ultimately up to Google (especially if you’ve had a manual action), we can’t make any guarantees to anyone who has been penalized. However, if we start on a brand new domain for you- of course we will guarantee our services. Can I see your List of Clients? Some clients choose to leave testimonials; some have even written blog posts thanking us. However, most of our clients are discrete professionals and do not want their competition to know they hired an SEO company. We very rarely link to our own clients. By the same token, we don’t ask our clients to link to us. We won’t put a link on the bottom of your website that says “SEO by GuruEffect” or anything silly like that. We can stand on our own two feet, without your link, and we’ll help your site stand on it’s own as well. We can help your business get more traction in the search engines, by helping to make you popular within the social channels. More than ever, search engines are using social signals to help gauge the authority of a site. We will help your website earn the authority it needs by encouraging interaction with your potential new clients within the social networks. Is This It? Is this your Whole FAQ? To be honest, we don’t seem to get asked the same questions over and over. Every client is different; every website is different. 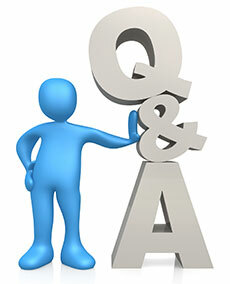 However, if you would like to leave a question below, we will certainly answer it. And we think that’s a whole lot better anyway!